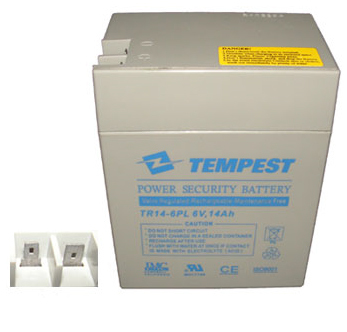 6 volt, 14 Ah for Medical Devices, Emergency Lighting and general purposes. For more information please refer to the specifications link. Length 4.25", Width 2.80", Height 5.51" (Total Height 5.51"), F1 and F2 terminals, Approx Weight 6 lbs.